Is Your Digital Signage in It for the Long Run? We hear it time and time again. A business purchases TVs from the local big box store to use as digital signage. Afterward they encounter problems with setting up the TVs, not getting the performance they wanted, TVs failing and not qualifying for replacement due to overuse. The reason for these problems is simple: Consumer TVs are not designed to perform the duties of digital signage—that’s a job for commercial-grade displays. If you’re thinking about using digital signage in your business, you should really think long term, and choose a solution that will give you years of trouble-free ROI. From engineered durability, range of sizes and innovative form factors to installation, integration and management, commercial displays excel at meeting long-term business needs. Professional Support – Commercial display vendors can provide installation, maintenance and support services as well as recommend content management partners. Effective Brightness and Contrast – Commercial displays are available with a brightness and contrast range that’s ideal for the venue. Resellers and systems integrators can take note of the lighting conditions in specified areas and select displays accordingly. Display Orientation – Commercial displays can be used in landscape or portrait modes and have a wide selection of industrial mounting options. Consumer TVs are landscape only. Innovative Form Factors – Extremely thin commercial displays are available that can blend seamlessly into the décor, complement existing structures or become iconic elements of the architecture. Easy Connectivity – Commercial displays make an installation much more economical for systems integration. Feed the display any type of digital signal and it will daisy chain to whatever the output requires. Variety of Inputs – Commercial displays feature a wide variety of inputs including RS232C, RJ45, USB, HDMI, DP, DVI-D and more. Easy Content Management – Web-based content creation/management platforms are supported by a wide range of software integrators. The platform works with the display’s embedded SoC (System on Chip) and eliminates the need for external media players. Fail-safe Engineering – Commercial displays are engineered to enable redundancies in content sources so that should one source fail, the display will automatically switch over to available backup sources, in a specified order. Reduced Power Consumption – The leading commercial displays use less electricity because they are air-cooled and require no internal fans. Fans increase power consumption, add bulk and pull in dust. Circuit-protecting Conformal Coating – Conformal coating is a thin chemical coating or polymer film that is topically applied to circuit boards to protect electronic circuits from harsh environments that may contain moisture, dust, grease, iron powder and other contaminants known to harm circuit boards. When applied, the coating “conforms” to the circuit assembly. IP5X Certification – Select commercial displays have passed the rigorous dust ingress test to receive their IP5X certifications for dust-proofing. They have protection against contact and are made to resist dust buildup, which means better performance and less heat generation. Outdoor Use – Outdoor commercial displays employ vandal-resistant glass and an IP56 design which allows for reliable outdoor operation. They are designed to be not only water resistant but resistant against the damaging effects of the sun, rain, snow, dust and wind. These displays also feature ultra-high brightness and contrast, luminance control, enhanced thermal management, polarized sunglass viewable anti-glare screens, plus available interactive touch panels. Commercial Warranties – Commercial displays are backed by 3-year commercial warranties with extended years of service coverage available. Consumer TVs, on the other hand, have a 1-year warranty and often specify that extended hours of use per day will void it. Picture this: It’s Wednesday morning and you arrive at your workplace – a large corporate headquarters. As you enter your department you look around and decide to take a workstation near the west windows. You sit down at a clean, uncluttered desk furnished with a monitor, keyboard, mouse, and nothing else. You log onto the system with your encryption key, your familiar desktop appears on the screen and you pick up right where you were when you logged off on Tuesday. Except that on Tuesday you took a seat in the east section. 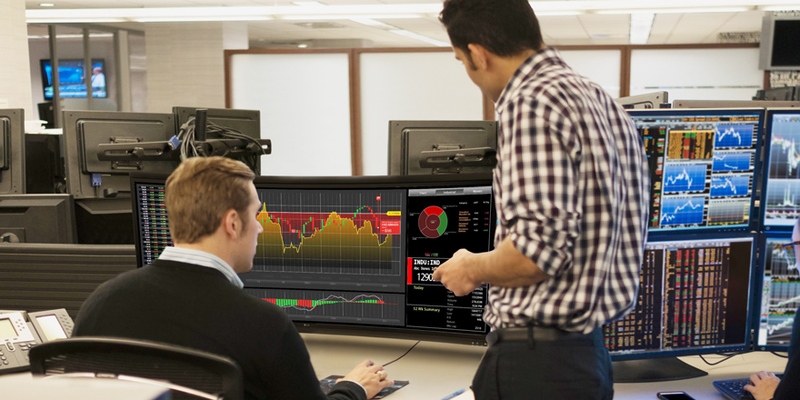 Everything you need, all of your applications and data, is at your fingertips. Other employees arrive and do the same. The workday begins. This is the world of Thin Clients – secure cloud computing endpoint devices including all-in-one (AIO) devices with keyboard and mouse, ultra-lightweight laptops, and small desktop boxes. Thin Clients create a highly productive work environment that brings numerous benefits to large businesses. Thin Clients are used as PC replacements to give end users access to any virtual desktop or virtualized application and give businesses a cost-effective way to create a virtual desktop infrastructure (VDI). A Thin Client is a trimmed-down version of a PC, and part of a network. It acts as an interface for a company’s data center where the files, data, applications, controlled functions and real computing power reside. Thin Clients are compatible with multiple hypervisors such as Microsoft, VMware® and Citrix®, and give an IT department many different options for applications to be used. High Security – Thin Clients are protected from user installation of unauthorized applications, and data cannot be copied to or saved to any location other than the server if IT has turned off the device’s USB ports. IT can also lock down a particular device if it is lost or stolen. Data, software and applications in the server are easily firewalled, monitored and protected and the IT department can enable multi-factor authentication, data encryption, anti-spam/virus/malware protection, and intrusion protection and detection. Thin Clients also offer companies a great deal of control over application installations and configuration management, user administrative privileges, user access to specific content and websites, and which devices can send out sensitive information. Ease of Management – A VDI with Thin Clients greatly reduces the burden on IT departments. The IT department can easily manage and monitor every Thin Client device on the network from a central location, whether it’s a few hundred units in one building or thousands of units spread out across the globe. Security updates, software patching and application/OS updates can be applied, tested and activated for all users at once. Besides having a lower total cost of ownership (including product, operation, licensing and administration) than PCs, Thin Clients are very energy efficient, using significantly less wattage on average compared to a 150-watt PC. If a company has hundreds or thousands of devices, the cost savings over time can contribute significantly to other business initiatives. The future looks very good for Thin Clients, and the businesses that use them. Today, more and more applications are moving to the cloud, and businesses are moving to a model where the data follows the user, rather than the user following the data. These are ideal conditions for Thin Client endpoints. Think Your Space Is Too Bright for Large Format Digital Signage? Then it’s time to outshine the sun. It’s a common concern in places such as airport concourses that are bathed in high ambient daylight. Will large format LCD digital signage be able to deliver crisp, vivid images amid all that brightness? With the right technology the answer is yes. LG’s Shine Out technology is a well-suited solution for delivering crisp, clear and vivid 4K UHD content in areas with direct sunlight, bright ambient light or harsh indoor lighting. When displays are placed in front lobby areas or window-facing applications where there might be a lot of sun, the harsh reflection and glare can wash out even the best images. To preserve image quality, Shine Out technology features an anti-glare, anti-reflective overlay that does not soften the image like conventional anti-reflective coatings. Instead, it actually increases contrast ratio and color saturation while deflecting the light. The overlay also protects the screen surface, which is very important in a public environment where people can get close to the screen and bump into it, scratch it or hit it with an object. And when you factor in the displays’ advanced local dimming function, the image quality maintains high contrast so colors pop. With LG large format 4K UHD displays, the backlighting in specific areas of the screen can be controlled to increase contrast and provide a clearer image. LEDs that can be switched on and off are installed behind the screen’s liquid crystal pixels. This means that a specific area on the screen that is displaying black can be darkened even further, by switching off the LEDs separately from brighter areas where the LEDs are switched on. The result is reduced light leakage, substantially deeper blacks and excellent contrast. To top it all off, LG’s IPS (In-Plane Switching) screen technology provides true wide viewing angles up to 178 degrees, where colors and contrast remain consistent and data is clearly readable. With non-IPS displays the viewer needs to be centered directly in front of the screen to realize the best performance – at an angle color and contrast decrease dramatically and data becomes illegible. IPS vastly improves off-angle viewing, which is extremely important in areas with heavy foot traffic. IPS panels also feature effective thermal management that eliminates image degradation and screen blackening that can occur with non-IPS displays placed in direct sunlight. 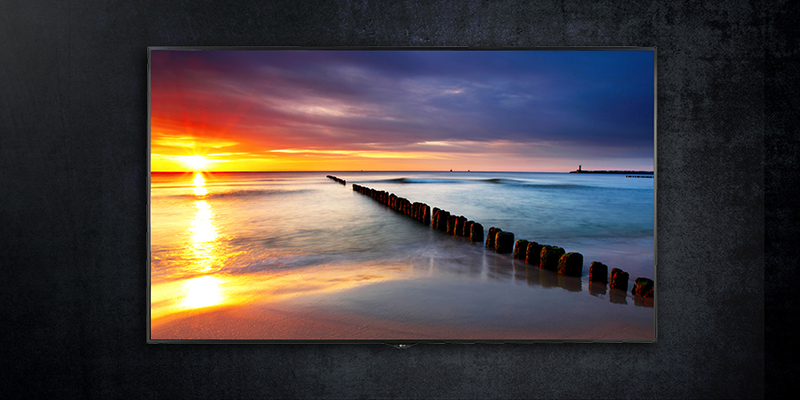 Large format 4K UHD displays are ideal for attracting attention and making the message matter. And with Shine Out, advanced local dimming and IPS they can cut through the brightness with a brilliance all their own. In 2018, the best video wall systems are made up of advanced flat panels that are lighter in weight, and less deep in profile than what was common not too long ago. If your video wall/flat panel supplier is not offering options that are light in weight (44 lbs. or 20KG), and slim in depth (3.42 inches or 87 mm) to allow for easier installation and easier maintenance of the displays after installa­tion, you’re using yesterday’s technology. It’s important to note that if a video wall is mounted in such a way that it protrudes more than four inches from a wall at foot-traffic level, then it is not compliant with strict ADA (Americans with Disabilities Act) regula­tions. For this reason video walls are often set back into the wall itself, to accommodate the mounting gear, cables and other hardware, and maintain ADA compliance. Remember also that weight considerations affect many aspects of a video wall installation: shipping costs to get the product to the site; the amount and cost of mounting hardware needed; the number of handlers required per panel installation, and maintenance costs after the installation is complete. Whether upgrading from older video wall technology or revitalizing your business environment with a first-time video wall, be sure to choose a video wall/display supplier that is at the fore­front in light weight, thin dis­plays and integrated mount­ing systems. Video wall calibration may sound daunting to end users and even to systems inte­grators frustrated with working with identical displays from the same manufacturer that look dif­ferent while showing exactly the same content. 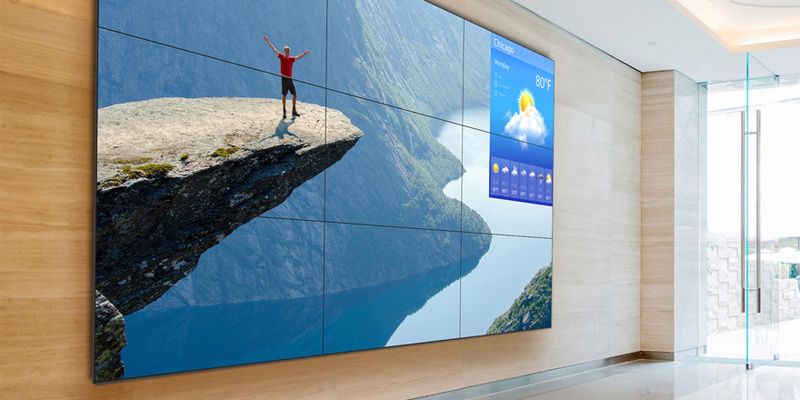 It all boils down to this: a video wall is by definition a configuration of individual images. So the different displays that make up a video wall must be calibrated to show a uniform picture across the entire wall. This means not only maintaining brightness uniformi­ty across the screens, but also keeping the edges of each display as bright as the center of each display, and keeping the color consistent across all displays. In digital imaging, there is nothing as off-putting as a video wall that includes a scene of a beautiful blue sky but has one off-color greenish display right in the middle that spoils the effect. The solution is to choose a video wall display provider that provides reli­able factory calibration (each display in a video wall design is set up at the factory to be calibrated with its sister displays in that video wall design). But there’s another important step. Due to environ­mental factors, third-party content software anomalies, and user error, there often needs to be some calibra­tion on-site at a video wall installation. So the video wall display provider must also provide a fast, easy-to-use on-site calibration system. Ideally this will include an Automatic ID setting for easy installation, so that if you install 100 displays, you do not need to waste valuable time setting up the unique ID of each one respectively. The Automatic ID eliminates the frustration. 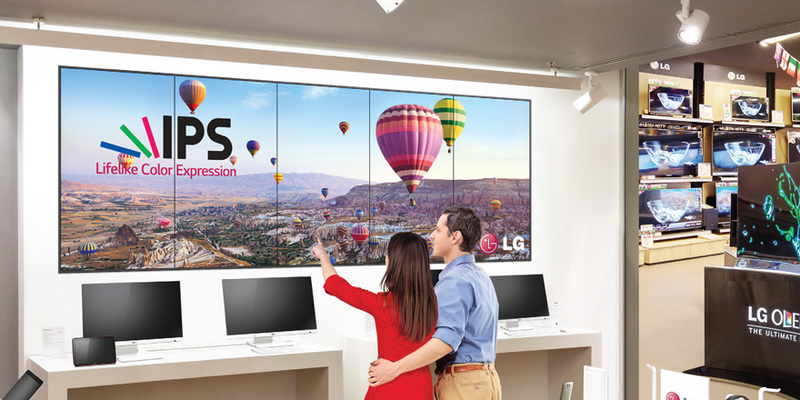 To address the challenges of matching brightness and color across all screens, LG video wall displays incorporate factory calibration as well as efficient calibration tools, including an Automatic ID setting that allows for easy installation – integrators can achieve an optimal image within only 3-5 minutes per panel. A video wall is a significant investment. And as such it should be expected to provide a breathtaking and realistic image to wow viewers, seriously engage them and make your message matter. Make sure your video wall is up for the task.